What is a displacement behavior? Displacement behaviors are usually normal behaviors that are performed at an inappropriate time, appearing out of context for the occasion. Displacement behaviors arise from situations of either conflict or frustration. Conflict refers to the situation in which an animal is motivated to perform two or more competing behaviors (e.g. approach or withdraw, greeting but fear of being punished). The inability to perform both of the strongly motivated behaviors can lead to conflict, resulting in the performance of a displacement behavior. Similarly, when an animal is prevented or "frustrated" from performing a highly motivated behavior (e.g. territorial aggression while confined behind a barricade) a displacement behavior can also be observed. Overgrooming in the form of acral lick dermatitis, yawning, circling, and vocalizations may be performed as displacement behaviors. What is a redirected behavior? When an animal is placed in a situation of conflict or frustration, another behavioral option is to redirect the behavior toward an alternative target. This may be the case when a cat is sitting on the windowsill and is aroused by cats on the property. Since access to the stimulus is prevented, the aggression may be redirected to another cat or person that approaches. This is known as redirected behavior. Stereotypes are repetitive behavior patterns without an obvious goal or function. They are usually derived from normal behaviors. Stereotypic behaviors may be performed as components of displacement behaviors or compulsive disorders (see below). They can also be due to physiological changes such as might occur with a neurological disorder (circling, head bobbing). Examples of stereotypic behavior include pacing and excessive grooming. What is a compulsive disorder? When an animal is repeatedly placed in a state of conflict, displacement behaviors may begin to be manifested during any state of stress or arousal. Eventually, the behavior may become compulsive as the pet loses control over initiating or terminating it. Thus, rather than displaying the behavior only in the situations in which there is conflict, frustration, or high arousal, the compulsive disorder may be displayed in times when the animal is minimally aroused. "Compulsive behaviors ... abnormal because they are excessive, exceedingly intense, or performed out of context." Compulsive behaviors are often derived from normal behavior patterns but appear to be abnormal because they are excessive, exceedingly intense, or performed out of context. Although some compulsive disorders are repetitive and may therefore be referred to as stereotypic (wool sucking, pacing, tail chasing), other compulsive disorders such as freezing or staring are not truly repetitive. In addition, since compulsive disorders in pets seem to respond to drug intervention in much the same way as compulsive disorders might respond in people, this term is now used to describe the condition in pets. The term obsessive-compulsive disorder (OCD) is sometimes used but it is unknown whether pets actually obsess when displaying these behaviors. There may be a genetic predisposition to compulsive behaviors. For example, flank sucking is most commonly seen in Doberman pinschers, spinning in bull terriers, and fly chasing in miniature schnauzers. In cats, wool sucking is observed more commonly in oriental breeds. Although many compulsive behaviors arise spontaneously as a response to conflict or anxiety, behaviors may become compulsive or stereotypic because they have been conditioned. For example, the owner who gives the young pet attention when it playfully chases its tail or the beam of a flashlight may encourage and reinforce the performance of the behavior. Similarly, owners that offer food or a toy in an effort to disrupt the behavior may also be rewarding the very problem they wish to stop. A second potential problem with the game of light chasing is that the pet may become frustrated from ever achieving its goal (i.e. catching and playing with the light) and frustration is a cause of displacement behaviors. Therefore, either avoid this type of play or insure that the pet ends the session while relaxed or by giving it a reward (chew toy, treat toy). How do I know if my pet has a compulsive disorder? In each case, it is essential to diagnose, rule out or treat any medical condition that might contribute to the problem. Some compulsive disorders have a component of self-mutilation (e.g. acral lick dermatitis or tail biting) that will require medical treatment. If the problem persists after all medical problems are diagnosed, treated, or ruled out, then behavioral modification, environmental manipulation and drug therapy may also be indicated. 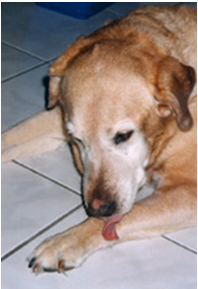 In dogs, compulsive behaviors include acral lick dermatitis, flank sucking, pacing, circling, incessant or rhythmic barking, fly snapping or chasing unseen objects, freezing and staring, polydypsia (excessive drinking), sucking, licking, or chewing on objects (or owners), tonguing or licking the air and other forms of self mutilation. 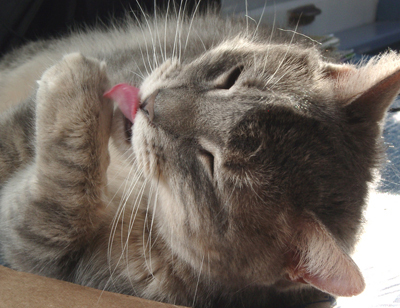 In cats, excessive sucking and chewing, hunting and pouncing at unseen prey, running and chasing, paw shaking, freezing, excessive vocalization, self-directed aggression such as tail chasing or foot chewing, over-grooming or barbering of hair and possibly feline hyperesthesia may all be manifestations of conflict, and may become compulsive disorders in time. How should compulsive disorders be treated? Since some stereotypic or compulsive behaviors are initiated by underlying medical problems, a complete medical work-up is always the first step. Behaviors must be evaluated individually since not all require treatment. In fact, treatment may only be necessary if the behavior poses health risks to the animal or seriously annoys the owner. For some pets, the compulsive behavior may be the most practical and acceptable outlet for reducing stress or resolving conflict in their home environment. For example, if flank sucking causes no physical harm, but occupies and calms the dog, then the compulsive behavior may be preferable to the use of calming drugs, or the development of other disorders (acral lick dermatitis, destructiveness, excessive vocalization). "Treatment may only be necessary if the behavior poses health risks to the animal or seriously annoys the owner." If the problem arises only in these times of frustration, conflict and high arise, it might not yet meet all the criteria for a compulsive disorder, and may be able to be treated with behavior therapy and anti-anxiety drugs alone. Identify the stimuli and situations that incite the response, and if they cannot be avoided, then the pet's response to the stimulus will need to be altered. By training the pet to settle and relax on cue (see our handout on 'Training Dogs - Settle and Relaxation Training' and 'Training Dogs – Handling and SOFT Exercises'), then using settle and relax commands during exposure exercises (desensitization and counter-conditioning), the behavior may be modified. For dogs a head halter can be particularly useful at achieving the desired response (see our handout on 'Training Dogs – Head Halter Training'). For compulsive disorders, reducing stress or finding methods of decreasing the sources of arousal and conflict are the first aspect of treatment that should be explored. Inconsistent training may lead to problems in the relationship between pet and owner. The key elements of the treatment program are to provide a) a structured daily program so that the pet has some degree of control and predictability to its daily routine, b) a highly stimulating environment with sufficient social interactions and physical stimulation to meet or exceed all of the pet's needs and c) to insure that the undesirable behavior is no way being reinforced or aggravated by the owner's responses. The basic program is one that provides a predictable daily routine so that the pet has some control as to what can be expected throughout the day (see our handout on 'Training Dogs – Enrichment, Predictability and Scheduling'). This program should provide the pet with scheduled opportunities to feed and eliminate, scheduled play and training activities throughout the day, and scheduled times for relaxation or object play. Conversely pets that receive attention or social interactions on demand and on no predictable schedule may be constantly in need of attention and play and may be unable to relax and settle. Next, be certain to provide a sufficiently enriched environment that meets or exceeds all of the pet's needs for activity and play (social, object play). A highly stimulating daily schedule with play and exercise periods and training sessions specifically tailored to the needs of the pet (e.g. retrieving, flyball, agility, for dogs, chase toys for cats, etc) can be interspersed with sessions of self-play (chase, batting, chewing or food manipulation toys) and sessions of rest and relaxation in a comfortable bedding area. The goal is to encourage and reinforce desirable responses and to sufficiently program the pet's day so that it can calm and settle at other times. Pets that receive attention on demand are being encouraged for these behaviors rather than to settle, relax and engage in object play activities in between interactive sessions. Training the dog to settle on cue (See our 'Training Dogs - Settle and Relaxation Training' and 'Training Dogs - Settle and Relaxation Training' handouts) can help to maintain a state of relaxation and de-arousal as the pet begins to get excited or out of control. "Behavioral modification is particularly effective when owners can identify and predict those situations and times when compulsive behaviors are likely to arise." Behavioral modification is particularly effective when owners can identify and predict those situations and times when compulsive behaviors are likely to arise. They can then initiate an alternative activity (before the compulsive behavior is overt) that is incompatible with the problem behavior, such as play, training, feeding, or providing a chew toy. Finding the most appealing and durable toys for the pet including toys which require manipulation to release food treats, feeding frozen food and treats (see 'Behavior Modification – Working for Food – Dogs and Cats'), and altering the environment (e.g. hiding treats for the pet to find) may help to keep the pet occupied and distracted at times when the compulsive disorder might otherwise be displayed. (Also see our handouts on 'Behavior Management Products' and on Play and Destructive Behaviors in cats and dogs). Owner responses to the problem behavior can further aggravate the problem. Giving attention or trying to stop the problem by giving a treat or toys may further reinforce the problem. Low levels of punishment can serve as a form of behavior reinforcement; punishment and owner frustration or anxiety over the pet's behavior can also further increase anxiety. On the other hand, if the behavior is observed in the owner's presence and ignoring the pet or walking away does not stop the response, then some form of remote interruption might be used (ultrasonics, water gun, siren, remote citronella collar, or leash and halter). Once the undesirable behavior has been interrupted or inhibited, the pet should be reoriented into alternative acceptable forms of play or settle and relaxation exercises can be practiced. Denying the pet access to the focus of its compulsion (or obsession) has mixed results. For example, a bandage or an Elizabethan collar may allow acral lick dermatitis or feline psychogenic alopecia to heal, but once the collar is removed, most cases relapse. In many cases, restricting access will worsen the problem by increasing anxiety or arousal. Instead, the underlying cause of the anxiety or conflict should be identified and removed or the animal should be desensitized to the stimulus. Can drugs be of value in the treatment of compulsive disorders? Drug therapy may be extremely useful for pets with compulsive disorders just as it is in humans with obsessive-compulsive disorders. A course of therapy with anti-anxiety drugs or pheromones may be useful for resolving the underlying anxiety and controlling the arousal that might be associated with displacement behaviors. Anxiolytics might also be used concurrently with drugs for compulsive disorders when the pet must be exposed to a potentially stressful or anxiety producing situations (new home, dramatic change in schedule, new baby). Since lowered serotonin and increased dopamine levels may be associated with some compulsive disorders, drugs that bring about a normalization of one or both of these neurotransmitters (e.g. clomipramine, sertraline, paroxetine, fluoxetine) may be effective in the treatment of these disorders. "Drug therapy may be extremely useful for pets with compulsive disorders ..."
Some compulsive disorders such as head bobbing and spinning in dogs or hyperesthesia in cats may be difficult to differentiate from seizure disorders. In cases where a seizure disorder has not been ruled out, a therapeutic response trial of anticonvulsant medications might first be considered. For further details on specific compulsive disorders see our handouts on 'Compulsive Disorders in Dogs' and 'Compulsive Disorders in Cats'.